The last two weeks I took a time out. The first week I visited my sister living on Usedom, Rumpel came with me. 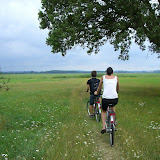 We cycled a lot of km’s, climbed on trees, swum in the Baltic Sea, took sunbathes on the beach, went to Poland and so on. Detailed reports would blow up the framework of this website, but I’ll provide some pictures at Picasa, here is also a YouTube video from Poland. So, if you ever have the chance to go to Usedom: Do it! !